World Market sells stuff from, you know, the world. It’s a cool store (formerly called Cost Plus) with food, furniture, housewares, body care, art, and lots of unusual candy, especially stuff from, you know, the world. They now also have house brands of various things, including chocolate. At $1.99 for a 3oz (85g) bar, they’re quite a good value for genuine chocolate, with dark chocolate of various intensities and flavor combinations. This review covers what they call Milk Chocolate (at a very healthy 42% cacao content), and 72%, 82%, and a tongue-boggling 99% cacao dark chocolate bar. I’ll also try a 64% dark chocolate bar with sea salt, and another 64% bar with pomegranate. Letâ€™s start with the clear winner. Milk Chocolate Compared to a standard chocolate bar like Hersheyâ€™s that should be shaped into a bunny and put in a basket of plastic grass, World Marketâ€™s Milk Chocolate bar presents a wonderful conversation among its several elements. First, itâ€™s structured – that is, it has a body of things to say, and theyâ€™re discernibly different. Second through fifth, itâ€™s got a nice nutty undertone, a perfect bit of sweetness, a rich and mellow chocolate fullness rounded out by real vanilla (not the artificial â€œvanillanâ€ in Hersheyâ€™s), and a buttery release of cacao liquor when you let a piece melt on your tongue. Wow this is good! In contrast, poorer quality chocolate is flat, and thereâ€™s no conversation. It can only say one thing: Iâ€™m sweetchocolate. World Market Milk Chocolate is diverse and multilingual by comparison. Itâ€™s definitely “darker” than your usual milk chocolate, but I think milk chocolate fans have got to try this bar. (With 42% cacao, it’s nearly as dark as Hershey’s Special Dark at 45%.) Really, itâ€™s one of the best milk chocolates Iâ€™ve had in a long time, and thatâ€™s counting bars three times the price. Dark Chocolate (72%) This bar smells mildly fruity when you unwrap the silver lining, and it had an interesting coconut-tasting undertone to me, but it’s not nearly as well-rounded as the milk chocolate bar. Itâ€™s less sweet, of course, but also a little unpleasantly bitter. In dark chocolate, thereâ€™s good bitter and not-so-good. Iâ€™d put this taste in the latter category. Overall, this bar was not very interesting. Dark Chocolate (82%) This bar is chalky. Itâ€™s not as bitter as the 72%, and itâ€™s less sweet by quite a large margin. Unfortunately, I didnâ€™t like its flavor, and there wasnâ€™t much structure. Overall, it was sort of like eating chocolate-flavored balsa wood. Dark Chocolate (99%) Whatâ€™s cool about trying a 99% bar? You get a sense of cacao in its pure state. And you learn why we put sugar in this stuff. Of course, when you eat a 99% bar, you canâ€™t say, “wow this is horrible candy!” You have to say to yourself, “Iâ€™m trying a different kind of food.” This bar had great snap, good cohesion, and you can feel the cacao liquor content. It was also chalky, and tasted pretty flat. I have to say I really didnâ€™t like this bar at all. Iâ€™ve had other extreme dark bars with complex and interesting flavors, but this one just came across like a grumpy old man who complains about his knee every day. With very dark chocolates, since we Candy Addicts are giving up the sugar, I think we need the reward of many undertones and overtones, some berry or coffee or nuttiness or… something. In other words, you need a well-rounded conversation of flavors. 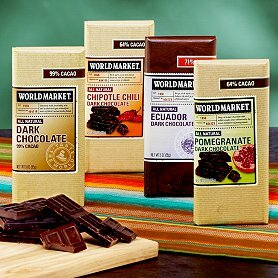 I was disappointed with the three dark chocolate bars from World Market, but at a mere $1.99, you might want to compare them to your other high cacao-content bars and see what you think. Sea Salt Dark Chocolate (64%) I like this bar. It has excellent mouth feel like the Milk Chocolate, and the sea salt hits you like little punctuation marks – distinctly. Itâ€™s not at all like eating a salty chocolate bar. Instead, youâ€™re eating a good dark chocolate bar with salt notes here and there, and the contrast is nice. As for the chocolate itself, it was a little bit smoky and earthy. Pomegranate Dark Chocolate (64%) Pomegranates are an acquired taste. Theyâ€™re pretty tart as fruits go, and most people like them as accents to other things, as here. Unlike the sea salt bar, the pomegranate flavor does suffuse the chocolate in this bar. Itâ€™s a nice combo if you like a tart fruity edge to your dark chocolate. I didnâ€™t find it that interesting, ultimately, but others might really like it. You get less of the underlying chocolate flavor in this bar, and the pomegranate flavor tasted a little off; there are no bits of the fruit itself at all. Chipolte Chili Dark Chocolate (64%) Timing is everything with this bar. On first bite, the genuine chili pepper really opens up the chocolate in an exciting, flavorful way. If things could have ended there, Iâ€™d really like this bar because the chili helped me taste the chocolate better. But seconds later, this experience becomes all about the pepper and the chocolate recedes into the deep background. You might really like this bar if you like chili pepper, but be aware that the chocolate flavor fights a losing battle. This is a chili pepper bar and, oh, with some chocolate. Editor’s Note: I love this Chipolte Chili Dark Chocolate bar. I am a huge fan of spicy foods and this chocolate bar was incredible. The spicy chipolte had a serious kick to it and was great! Itâ€™s great to see World Market offering a reasonably priced, genuine chocolate bar with quality ingredients, and in so many varieties. (Theyâ€™ve also got single-origin chocolate from Ecuador, Costa Rica, and New Guinea at $2.99 each.) The three high-percentage dark chocolates I reviewed here didnâ€™t do a lot for me, but I did enjoy the Sea Salt Dark Chocolate. The real winner, though, was the World Market Milk Chocolate bar. This chocolate bar – midway between milk and dark – is completely delicious. I ate the whole thing long ago, and I’m longing for more. This excellent bar is a well-rounded conversationalist; I recommend you take a listen. Unfortunately, you’ll have to trek to World Market to buy these, as they aren’t available online. I need to go talk to some chocolate now…have one helluva serious conversation with the Milk Chocolate bar, I’m thinkin’…and lucky me, World Market is not too far!